Legionary of Christ Fr. Kevin Lixey works in the Roman Curia helping the Church make a contribution to the world of sport, with the aim of promoting a sports culture suitable to the integral development of the individual. ZENIT spoke with Fr. Lixey about the Denver Broncos quarterback, Tim Tebow, after Tebow led his team to an overtime win in last Sunday’s playoff game. Interesting factoids: 1) Did you know that when Tim Tebow wrote John 3:16 in his black eye shade that 92 million people Googled “John 3:16” to see what it was? 2) And did you know that the National Football League has now prohibited players from putting any message in their eye shade. 3) And did you know that doctors suggested that Tim’s mom abort him? This interview is an interesting to look at Tim Tebow and sports in general through the lens of Catholic thought. Read the article here. 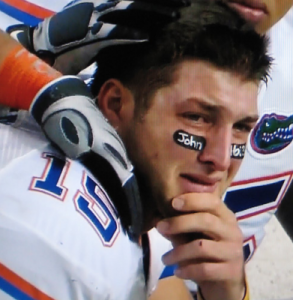 My previous blog “Tim Tebow , Love Him or Hate Him” is here.